SYSGO with PikeOS, Esterel Technologies with SCADE Display®, and Core Avionics & Industrial Inc. (CoreAVI) with OpenGL ES/SC Graphics Drivers collaborate to offer integrated and certifiable solutions for the design of critical embedded avionics display systems. These solutions benefit from the most recent technologies available in the COTS avionics market, while offering capabilities for high performance embedded OpenGL SC and OpenGL ES Human Machine Interfaces (HMI) with DO-178C objectives up to level A in the aerospace industry. These integrated solutions for avionics displays span model-based design of the HMI applications, certifiable code generation, seamless integration with the RTOS (Real Time Operating System) and the OpenGL drivers, as well as deployment over the latest generation of graphics processing units (GPU), while providing options for DO-178C and ED-12C certification kits (up to Design Assurance Level A) for safety critical environments, including all certification evidence required for regulatory approval. 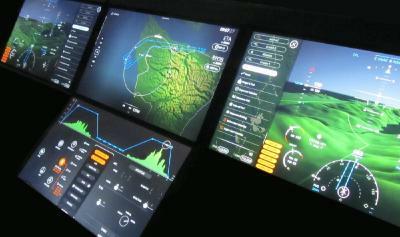 SCADE Display, Esterel Technologies' powerful and versatile model-based design and development environment for embedded HMIs, is coupled with the SCADE Display KCG code generator for the automatic generation of platform-independent OpenGL C code. Generated code thus integrates seamlessly with SYSGO PikeOS and CoreAVI OpenGL drivers SCADE Display KCG has already been qualified as a development tool under DO-178B level A, and is now delivered with a complete certification kit demonstrating how it has been developed as a DO-330 TQL-1 tool for use in critical applications with DO-178C level A objectives. "Esterel Technologies is proud to release its DO-178C level A certification kit for SCADE Display, which represents a world premiere for a COTS development tool, and to provide such a joint solution for critical avionics displays in collaboration with SYSGO and CoreAVI" says Bernard Dion, CTO of Esterel Technologies and EUROCAE secretary of the DO-178C committee subgroup on tool qualification. PikeOS is both an RTOS and a hypervisor built upon the Safe and Secure Virtualization (SSV) technology that enables multiple operating system interfaces, called Personalities, to work safely and securely on separate sets of resources within a single machine. PikeOS supports a large range of Personalities, including PikeOS Native, ARINC 653, Linux, POSIX, Certified POSIX, Android™, RTEMS, AUTOSAR, iTRON and others. PikeOS supports single- and multi-core processor architectures and is certifiable to safety standards like DO-178B/C, IEC 61508, EN 50128, IEC 62304 or ISO 26262. "SYSGO's PikeOS is targeting safety-critical applications since its commercialization in 2005, "says Jacques Brygier, VP Marketing at SYSGO. "Working together with leading suppliers in this area as Esterel and CoreAVI was a clear decision to bring to the market an integrated certified solution that combines innovation and field-proven technologies." Note that in addition to be involved in security standard Common Criteria EAL 5/6 evaluation, PikeOS is the first RTOS/hypervisor SIL 4 certified on a multi-core processor. This announcement coincides with CoreAVI's launch of its newest safety critical OpenGL graphics drivers for AMD's (NYSE:AMD) Radeon™ E8860 discrete GPU. Designed from ground up for resource constrained devices, CoreAVI's suite of OpenGL SC / ES, H.264/MPEG 2 video decode, and OpenCL drivers enable system manufacturers to harness the complete capabilities of the most advanced embedded graphics and system on chip processors with safety and mission critical platforms. "The integration of CoreAVI's suite of safety critical OpenGL drivers with SYSGO's PikeOS and Esterel's SCADE Display represents CoreAVI's continued approach to ensure seamless product interoperability with our key partners' technologies thereby reducing risk, schedule, and cost for our mil-aero customers" says Steve Viggers, Vice President of Software Development. These joint solutions for critical avionics display systems will be showcased at Embedded World 2014 on the SYSGO booth (Hall 5/5-371), illustrated by a SCADE Display glass cockpit HMI with synthetic vision, running on top of a graphics platform integrating SYSGO PikeOS and CoreAVI safety critical OpenGL driver for AMD E8860 GPU. SCADE Display tool and CoreAVI drivers will also be on show on the Esterel Technologies (Hall 4/4-303) and AMD (Hall 1/1-138) booths. SYSGO provides operating system technology, middleware, and software services for the real-time and embedded market. 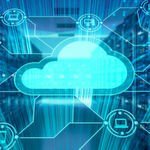 A differentiating capability of SYSGO is the SSV (Safe and Secure Virtualization) product PikeOS, a real-time operating system and hypervisor built upon a small, fast, safe and secure microkernel. It supports the co-existence of independent personalities on a single platform, including ELinOS, SYSGO's embedded Linux distribution. 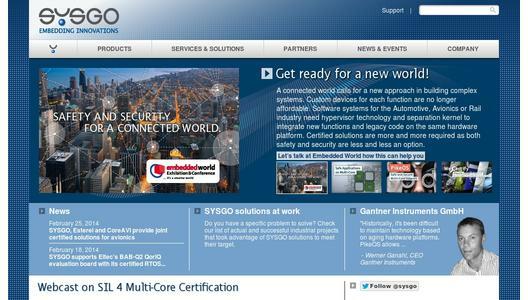 SYSGO supports international customers with services for embedded Linux, real-time capabilities and certification at the highest levels for safety- and security-critical applications. Markets include Aerospace & Defense, Automotive, Railway, Medical, Industrial Automation, Smart Energy and Security. Customers include Airbus, Thales, Continental, Raytheon, Samsung, Rheinmetall, Rockwell-Collins, B. Braun, Miele and Rohde & Schwarz. SYSGO, majority-owned by Thales, has facilities in Germany, France, The Czech Republic, UK and North America, and offers a global distribution and support network, including Europe and the Pacific Rim.